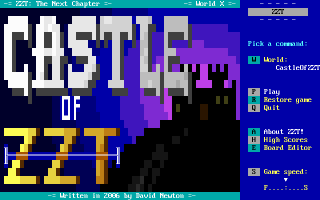 I wrote Castle of ZZT in 2006 just after moving to America, on an ancient and senile laptop while waiting for a new computer to be delivered. 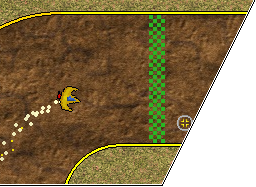 ZZT was just about the only thing that it could reliably run, so I spent most of my waking hours hammering it out from rough ideas that I'd drawn on a sheet of paper (still the greatest amount of design documentation I've ever done for a ZZT game) and it was completed in what I would guess was about two weeks. It's the biggest ZZT game that I've ever made, with a total of 68 boards compared to the other two classic-styled ZZT games that I made earlier, it shows just how much you can put your mind to something due to the power of boredom. You'll need the ZZT executable to run the game - see Z2, the premier site for ZZT (and an unmatched hive of lunacy) to get it.